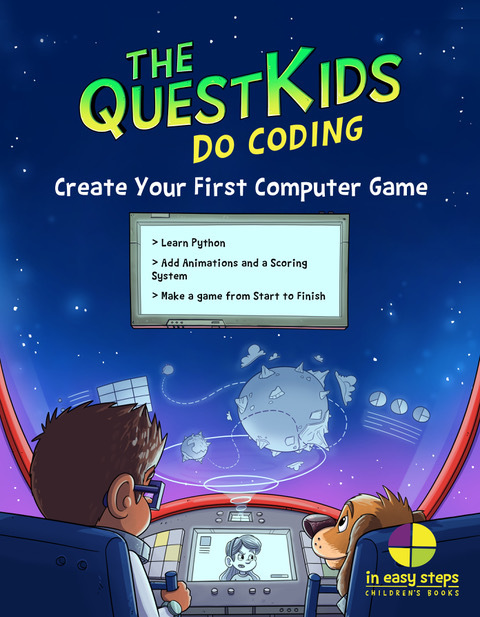 The second title in The QuestKids® children’s series from In Easy Steps – designed to make learning fun for children aged 7 upwards. Fully illustrated, and with a captivating storyline, this book teaches children how to build their first computer game in a fun way, and in easy steps. Dan Devices and Tiffany Tech are the best of friends, and an amazing team who love to explore and help each other whenever they can. Dan adores devices; Tiff loves tech, and both are on a constant quest to learn new things and look for fun and adventure in everything they do. The friends are joined by their pets, Smuffy and Chew-Chew, who help them out in their own special way. Together, they are The QuestKids! Using a great storyline and delightful images, Create Your First Computer Game in easy steps teaches children aged 7+ how to create their own space shooter game for PC using the Python programming language. The player will control a spaceship and have to eliminate or avoid aliens. The aliens will appear randomly on the screen. If the player shoots an alien, their score will be increased. If the alien hits the spaceship then they will lose a life. Once the player is out of lives, the game will end. The overall goal of the game is to get the highest score possible before you lose all of your lives. Add a spaceship to the screen. Move and animate the spaceship. Add aliens to the screen/alien movement. Randomise the aliens coming onto the screen. Remove/animate aliens once they have been eliminated. Add a Game Over screen. 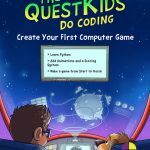 A supporting website (www.thequestkids.com) provides them with downloadable resources (to follow) and additional interactive learning. 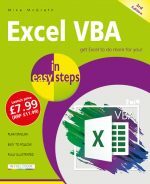 The coding steps are shown in the familiar In Easy Steps style, and presented in child-friendly language. By the end of the book, children will have a fully-functional computer game and a great book to refer back to for future projects. Darryl Bartlett has a wide experience in the world of web design and development especially using the WordPress platform. He first got into Web Development during his studies where he was building basic websites using HTML. He has since gone on to build his skill set and worked with top professional Web Development companies. He also builds websites for local businesses on a freelance basis, and works on apps for various platforms. Darryl is also the author of WordPress in easy steps and the first title in the QuestKids series: Create Your First Website in easy steps. Ben Barter is a creative illustrator. He has worked for a range of clients, big and small, on a wide variety of projects and has a deep understanding of the use of staging, framing and building a story within the illustration to capture the viewer’s attention. His credits include working with Paul on the storyline and illustrations for Mascots! Go for Gold.